So while enjoying the superb weather from my swing let me tell you about the new L'Oreal Super Liner Gel Matic. These were launched in their L'Or Luminere Cannes Collection and I am pretty sure you must have been seeing them in ads a lot.. especially being mentioned in the makeup breakdown of the actresses in Cannes. I got Silver Mania, so let's see how this turned out, yes? This is the first gel liner in a pen format from L'Oreal and comes in 6 variants - Ultra Black, Deep Brown, Silver Mania, Glamor Gold, Turbo Turquoise and Blue Force. Coming to the formula, it has left me quite impressed so far! We all know how great gel liners are but it a hassle to use them with the brush, Having one in a pen form is so so great! The pencil goes on smoothly, without any tugging or pulling. Even though the silver variant has glitter, it has never felt gritty. Ever. Plus the shimmer is very very fine and I have not faced any irritation with it. Pigmentation is good. 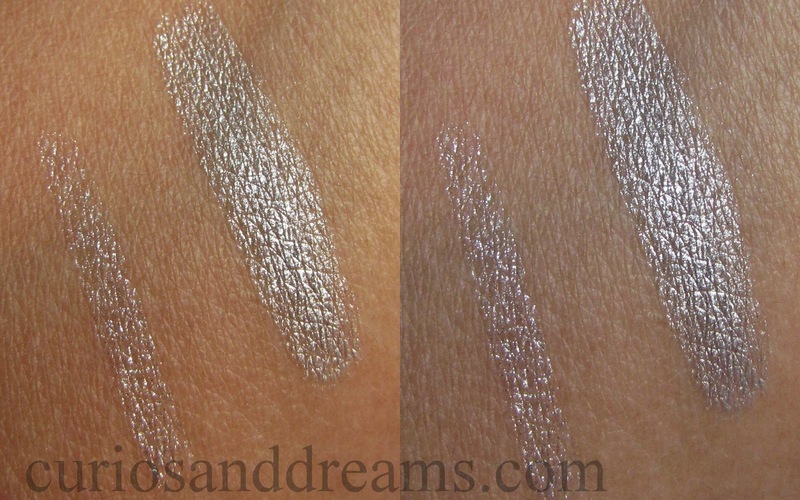 One very light swipe will give you slight sheeny shimmer (as seen in the swatch below- left). It takes 2 good swipes for the intense silver colour to show up on my lids. The formula dries very quickly and settles to a waterproof, smudge proof finish and lasts me all day (8+hrs approx is the longest I have tried) till I remove it with a makeup remover. On the waterline it stays for around 4-5 hours. If you do have a habit of rubbing your eyes a lot, the shimmer (not the colour) does smudge a bit. So try not to be too restless with your hands and eyes. You need to be cautious while using the little sharpener (I have used it a few times but a couple of times when I wasn't very careful and in a hurry, the pencil tip broke). Also when using it on the eyes try not to take out a long length from the pen since it will crumble. And I don't think you would be happy wasting product like this. You must have seen it in our Red Carpet Look, Ombre eyeliner! We loved it effect so much! It took us a couple of days to come up with a wearable look, since silver isn't a super flattering colour to work with (and it would have made no sense to just use it near the tear duct area.. like a small dot :P). Anyway, see the photos for yourself and let us know what you think, ok? I liked the Super Liner Gel Matic. Afterall, it is quite exciting to see a gel liner in a pen form. If you are at the counter next time, make sure to check these out. I so badly want to try out some other more wearable shades - Blue, Gold and Brown mainly! * Disclaimer: Press sample. However, the opinions expressed here are our own and honest.